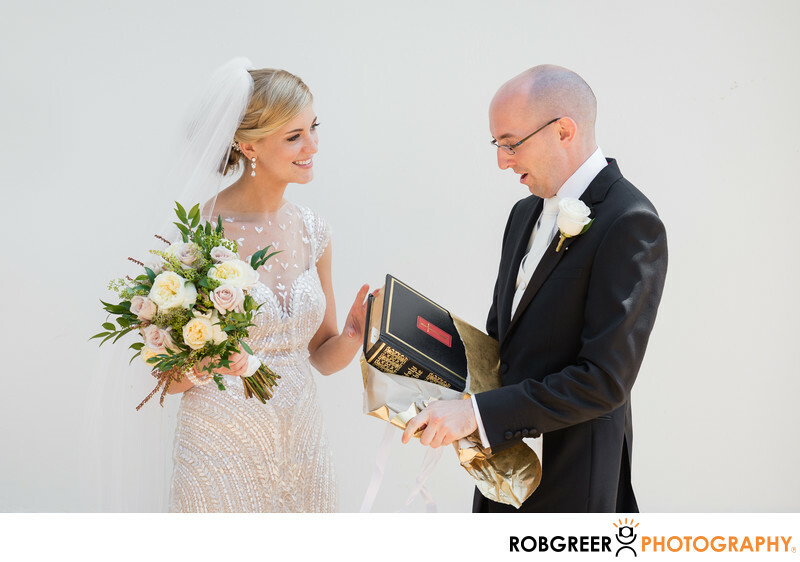 This bride presented a Bible as her groom's gift immediately after we completed the first look at Sacred Heart Chapel at Loyola Marymount University in Los Angeles. I thought it was an excellent choice as the couple is deeply spiritual and the groom a biblical scholar. I'm a student of history and also an antique store junkie (in addition to being a book collector) and so I am aware that previous generations often had a family Bible that was presented to a groom on his wedding day that would then stay in the family for decades if not centuries. I like to think that my photograph of this moment will serve as an excellent reminder for future family members as to where the history of this particular Bible began for this incredible family. Sacred Heart Chapel at Loyola Marymount University is located in Los Angeles, California. Keywords: Loyola Marymount University (9). 1/800; f/5.6; ISO 400; 112.0 mm.